From east to west and north to south, homify 360° is your proud source of noteworthy creations in terms of architecture and interior design. 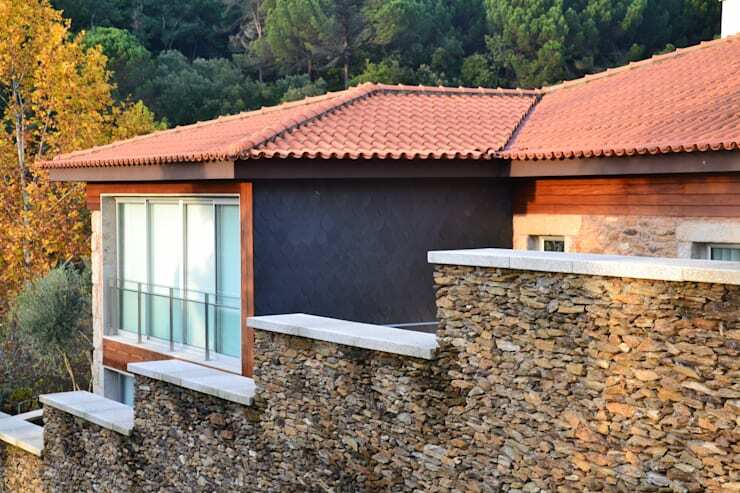 Today we set off to Cabeceiras de Basto, located in sunny Portugal, for a look at a deliciously modern residence. Architects and designers Paula Novais is proud to have blown some new life into an old construction. What was once a house built in a “Minho” style (an ancient architectural style typical of Portugal) has now become a contemporary vision of modern aesthetics. And what they achieved with their combinations of colours and materials is really the bewitching factor. In the old Minho-style houses, it was not uncommon to add an externally paved space to the back of the house. This area was typically used to dry various types of seeds, fruits or corn from the fields, as well as to dye clothes and fabrics. Fast-forward to the 21st century and we see a contemporary reinterpretation of this area, which now functions as a stone-paved patio. What was once used for labour now serves as a leisure zone, for it is here where we can sit and enjoy some Portuguese sangria in the afternoon sun, revel in some stargazing at night, or just watch the youngsters enjoy their playing. Notice how striking those ground floor lights sparkle against the pebbly stone wall, creating a magical contrast between old pattern and modern illumination. In renovating the house to make it fit in with today’s modern style, a lot of the old was left as homage to the old tradition. For example, the side wall noticed above (in the shadow) shows a fish scale-type coating, which is very characteristic of the old Portuguese style. Balancing out neatly are some modern wooden slates used to complement and frame the new windows added to the facade. Notice how softly all the neutral tones blend in, yet also stand out on their own. In the living room we find a perfect mix and match between old and new. The stone used for the wall outside makes a return in the main wall of the living room, creating an ideal backdrop for the furniture. The lighting shining from the ceiling perfectly enhances that grainy texture, very similar to what we witnessed outside. For the furniture, a blend between rustic and modern was chosen, symbolically portraying the different voices and personalities of the friends who gather here on a regular basis. Rustic or otherwise, you will be spoiled for choice when you see our stylish range of living room designs here on homify! 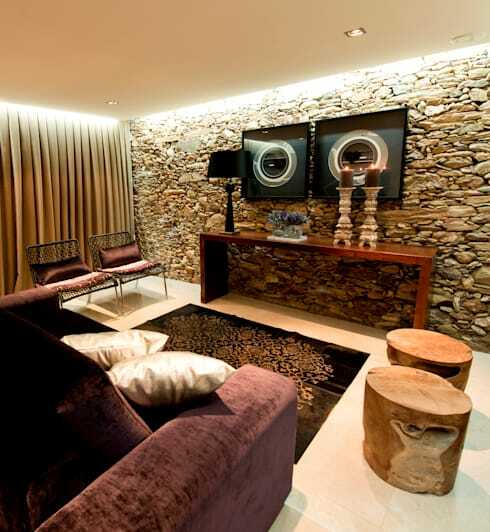 The TV room, where the rustic style takes a uniquely glamorous turn. With the decor and furniture becoming warm and elegant, the colour tones also lean towards a chic palette of dusty lilacs, dark chocolate browns, and pearly whites. We just love the elegant way in which the cabinet frames the television set, making it stand out sublimely from the rest of the furniture. 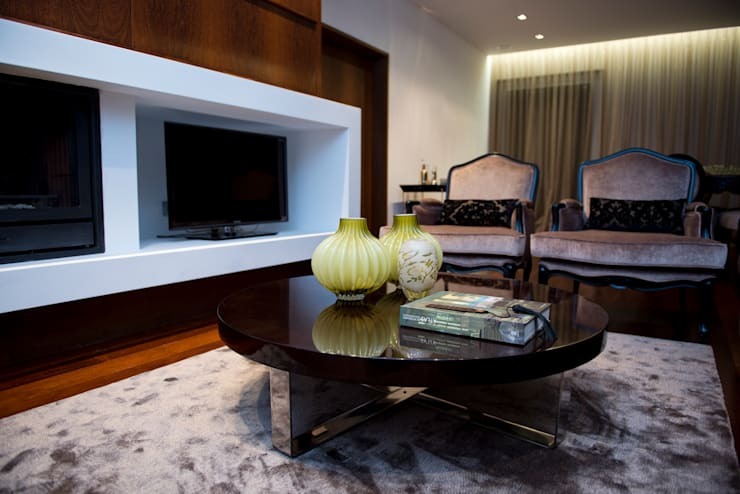 Designing a TV room is so much more than just placing a TV in one corner… Let’s get to work on Creating your ideal TV room. 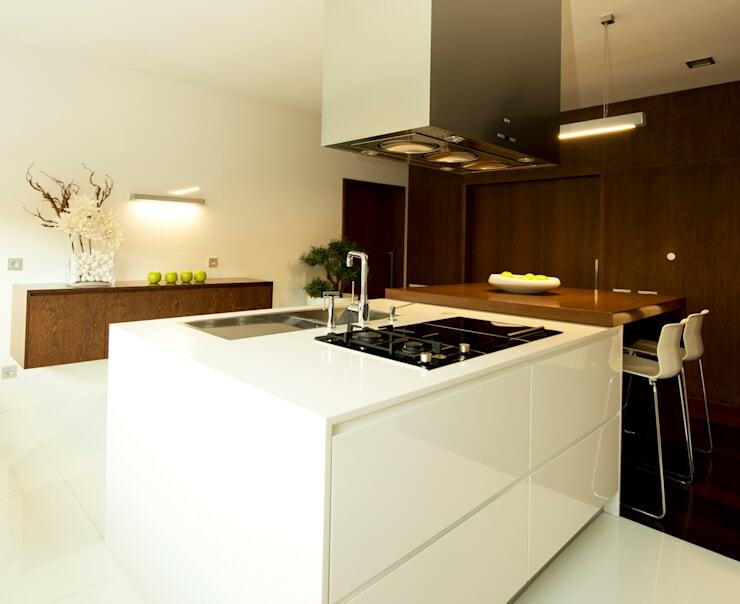 For the kitchen, a seamless integration between the culinary space and eating area was designed. What could be better than a wall-less space where food gets prepared and cooked in the one corner, while friends and a bottle of wine keep you company in the other? Wood in light and dark tones offer a coating of simplistic sophistication to this open area, made very modern by those sharp and simple lines. And it is also the wood that provides that much-needed warmth – how else can the heart of a home function without warmth? To play along with the warm wood and cool whites, a touch of stainless steel enters the culinary game in the form of select appliances. And just when we think this kitchen space couldn’t get any more striking, those wall- and ceiling lights add some sparkling illumination to the image. Simply sensational! We are in the bathroom, and it is as if we have set foot in an old black-and-white movie. Hollywood at its finest! 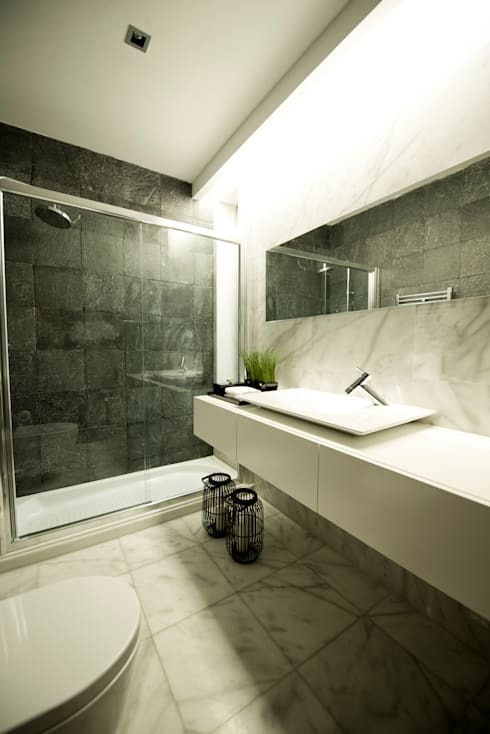 Marble adds a firm air of sophistication, with swirls of crisp whites and greys ensuring an elegant space. The shower area stands out beautifully from the rest of the room, with those dark grey tiles becoming a very strong focal point. And just to add an ever-so-slight hint of colour, some decor plants were placed on that spacious crisp-white sink. Is there any better way to end a tour than a memorable image to stay with you? How about this bathroom space that is worlds away from the marble room we just encountered? 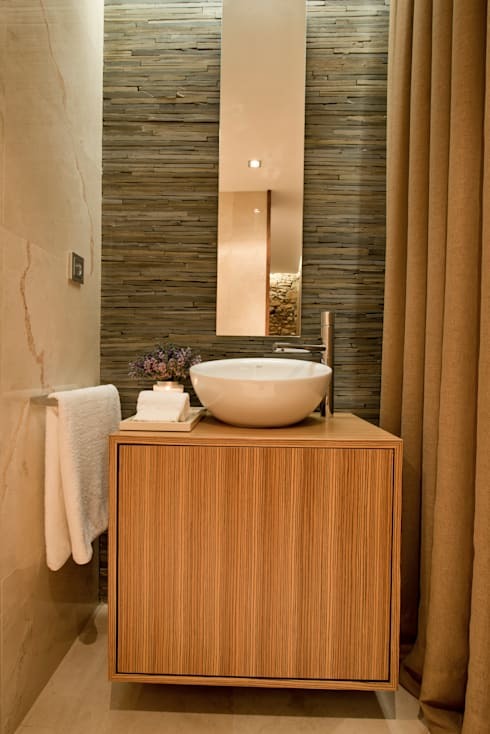 Where the previous bathroom flaunted a chic palette of metal tones, this one opted for a warmer vision of wood and stone, boasting delicious hues of rich caramel. Cosy yet elegant. A small space, yet clean and full of texture. This bathroom certainly holds its own against the rest of this stylishly brilliant house. Of course we are in love with this house, but we really want to know what YOU think of it!